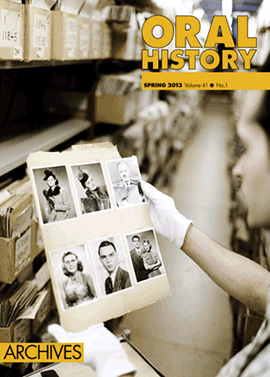 This article is about using archived oral histories in research. It advocates greater exploration of oral history archives in the UK in light of burgeoning research into the history of post-war society and the social sciences. Drawing on the author's experience of utilising interviews from the Millennium Memory Bank (MMB), it offers a critical reflection on the process of using this particular archive from the perspective of a social historian. Although the challenges of working with the MMB are noted, its unprecedented scale, and incorporation of the 'life history' method, demonstrate its value as a source for historical enquiry. The author highlights the importance of summaries and supporting literature attached to interviews to assist with accessibility and contextualisation, envisioning the archive as an ongoing process, whereby original and subsequent researchers ensure its legacy. This article is an initial exploration of the interviewee's family as an audience for oral history. Many library catalogues are now web-based and as we enter the realm of direct online access to archival material, oral history recordings are increasingly accessible. This visibility has widened access to oral history and will continue to do so, but there has been as yet little research into how families of interviewees react to the recordings of their relatives held in archives and libraries. In this article I highlight some of the ethical and practical considerations concerning archives when these detailed and personal testimonies are made available to interviewees' families. Do the families listen to all, part or none of the - often lengthy - recordings and do they hear what they expected? How do the oral histories mesh with the transmission of stories within the family? What are the implications of increased online access both for interviewees' families and for the archivists and librarians who are responsible for archived oral history and its wider dissemination? This paper is concerned with what scientists say about themselves, and in particular about their childhoods. It argues against a common tendency in biographical and autobiographical accounts of all kinds to identify a number of events in childhood that influenced the course or content of adult life. The paper draws on detailed, extended life story interviews with Earth scientists, collected recently for An Oral History of British Science, led by National Life Stories, at the British Library. I argue that these scientists recognise themselves in particular representations of themselves as children; these representations tell us about their identity as adult scientists, not about the early development of an interest in science. A central focus of Monash University's History of Adoption in Australia project was the creation of an online repository of self-generated life stories from those who had been touched by the adoption experience. There are currently seventy-three stories online, forty-four of which come from adoptees, thirty-seven of whom are local. These generally speak in a confessional mode from a position of grief, suffering and a pervasive sense of betrayal. There are also audio interviews with seven intercountry adoptees, whose life stories are framed somewhat differently. This paper will explore the distinguishing features of this select group of intercountry adoptees' stories, how they express the indeterminacy of transnational identity and redefine concepts of 'home' and 'family'. This thirty-year retrospective explores the development of reminiscence theatre in many different forms and puts the work into its cultural and educational context, demonstrating how oral testimony has provided the basis for the entire body of work produced by the Age Exchange Theatre Trust and the European Reminiscence Network. It explains how different audiences were addressed and how older people's contribution of their life experience remained at the heart of all the various projects. The article covers verbatim theatre by professional actors, older people's theatre developed and performed by groups of elders, inter-generational and inter-cultural work and therapeutic uses of reminiscence. This article is a reflection on how the digital revolution affected the author's first major project as an oral historian: a study of the Ukrainian community in Sudbury, Canada. Digital technology reared its head in every stage of this project and the author's experiences speak to the rapid and recent digital transformation that has shaken up the field of oral history. Here she discusses the opportunities and challenges she faced when recording, organising, interpreting, disseminating, and critically engaging with her interviewees' stories. Specifically, she provides a detailed summary of her efforts to create a searchable interview database using Stories Matter, free open source software, and a website, www.sudburyukrainians.ca, that showcases her project and its ethos of sharing authority. New media allowed the author to bring her interviewees' stories to life in new, innovative, and important ways. Verbatim theatre at the National Theatre (at the Cottesloe), April - August 2011 and then at the Olivier, July - September 2012.